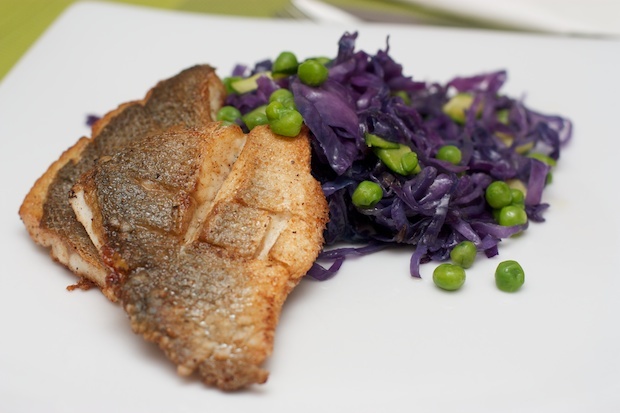 Wash and thoroughly dry the sea bass fillets and coat with flour. Cut the green of the zucchini into small cubes. In a pan pour a tablespoon of olive oil and heat it, and when hot, add in the cubes of zucchini, sprinkle with salt and pepper. Cook on high heat for 5 minutes stirring frequently. Remove the cubes of zucchini and set aside on a plate. Add 1 tablespoon oil in a skillet, add the peas, salt and pepper. Cook over high heat for 5 minutes. Remove from the pan and pour the peas into the pot with the zucchini. In the same pan add the finely chopped cabbage and cook for 3 minutes. It should remain crisp. Remove vegetables from the pan and mix the three vegetables together. In a pan pour the remaining oil, the sage leaves and garlic. When it is nice and hot, sear the fillets 5-7 minutes per side depending on thickness of fillets. Place in individual dishes with the vegetables on the bottom and the fliet resting on top. Serve immediately. If you want, you can score and flour the fillets first as you see in the picture but it is not a necessary operation.